For a long time, the Gitzo G1327 Carbon Fiber Tripod was my personal tripod choice for all but the heaviest lenses I use (and it can support them as well). 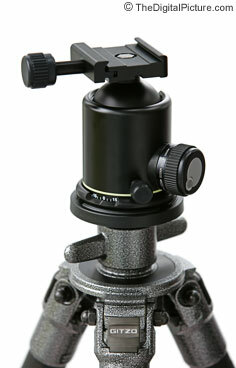 The G1327 has been discontinued - replaced by a new line including the Gitzo GT3530S 6x Carbon Fiber Tripod. Unfortunately, most people buy a cheap tripod for their first support. Frustration often leads them to buy a better tripod. In the end, serious photographers will upgrade to a high quality tripod such as the Gitzo G1327 Carbon Fiber Tripod. Skip this costly upgrade cycle and buy right the first time. Few regret buying a quality tripod - a quality tripod will make you want to use it more - your photography will improve because of it. Mountaineer Carbon Fiber Tripods are "up to 30% lighter than equivalent alloy version without compromise on strength, torsional stability or durability" according to Gitzo. Gitzo sizes its Mountaineer line by series - from 00 to 5 (skipping 4 at this moment). The higher the series number, the higher their load rating. Many experts recommend buying a tripod that provides at least a 50% overcapacity. And remember to factor in any stabilizing weight (such as a camera bag) that you hang from the rapid column hook. Series 5 Gitzo Tripods can support loads up to 33 lbs and would be appropriate for Canon's heaviest telephoto lenses such as the Canon EF 600mm f/4 IS and 400mm f/2.8 Super Telephoto Lenses mounted on a full Wimberley Head. Series 3 (the 3 in the G1327 model number) with its 24.5 lb weight rating is the most appropriate for my general use applications. Series 2 would be fine for smaller lens setups. Within each series, Gitzo models are generally available with and without a rapid (or optionally geared) center column and with 3 or 4 leg sections. I selected the rapid center column as I really like the flexibility and setup adjustment speed it provides. This is a very solid and easy way to extended the length of the tripod without adjusting all three legs. The rapid column is removable and also replaceable with a shorter column. I choose the 3 leg section model as it extends higher than my needs. 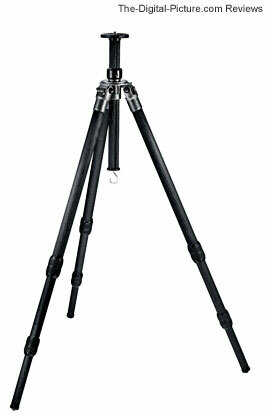 The Gitzo G1327 Carbon Fiber Tripod extends to 70.6". Then add an Arca-Swiss B1 Ball Head and a Digital SLR body. The result is a viewfinder that is about 1 foot higher than my eye (I am 6' tall). The four-section 3 series Gitzo has reduced stiffness becuase of the smaller diameter leg sections in the four section. The Gitzo Mountaineer Tripod legs are locked very solidly with twist-type locks. These are not my favorite way to lock tripod legs - I like the faster clamp style better. But, the twist locks are not hard or slow to use. They require only about 1/4 turn to tighten/loosen. Adjustments are very quiet and the result is rock solid. The G1327's legs adjust to 24º, 55º or 80º angles to accommodate various terrain and high requirements. After using the Gitzo G1588 Carbon Fiber Monopod, I had to give the G1327 a try. And after giving it a try, I had to keep it! And later added a Gitzo G1548 Tripod to my setup. Pictured above is an Arca-Swiss Monoball B1 Ball Head mounted on a G1327. "With the new 0 series models G1027 and G1028, tripod weight is down to just under 800g (1.75lbs), meaning that a complete tripod/ball head kit can weigh under 1 kg (2.2lbs)." "Gitzo carbon tubes use an exclusive process based on pull winding of long carbon fibres which are precisely wrapped and combined under high pressure and temperature with epoxy resin to a 1.5mm wall thickness. This manufacturing process ensures stiff, light tubes resistant to bending, has good tensile and compression strength, a high degree of stability in extreme temperatures, absorbs vibration and withstands fatigue better than other carbon fibre tube processes." "Unique grooved, carbon Rapid centre columns are now fitted to prevent rotation and increase stability and include stainless steel weight hook. " "Mountaineer tripods are now constructed using a "screw thread and glue" dual jointing technology pioneered by Gitzo called "HIS". This provides greater strength and security on location. " "Telescopic leg extensions can be set without slippage with rubber cushioned leg locks. Mountaineer tripods are fitted with sliding stops, which enable legs to be set at different angles." The Gitzo link below will help you select the model number that works best for you. Then use the "Buy" button and search for "Gitzo <model number>" to get a price.